Towse: He looks so young. 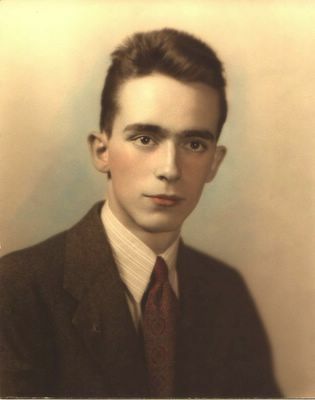 High school graduation photo, 1942. He wouldn't turn eighteen until December 1942, and (the way I heard it) his mom wouldn't let him or his twin brother enlist while they were underaged and needed her signoff. He went off to MIT for the fall/winter term and enlisted after the end of that term, after he'd turned eighteen. Turned out to be a good thing that he'd spent that time on campus. After the war, when GI Bill students flooded the colleges, MIT would only take on GI Bill students who were returning students, which he, with that winter term completed, was. He re-enrolled and finally finished with his PhD with four children (later to become six) in tow. Love the "colorizing" that was the rage then. I told my mom how handsome I thought he looked in the picture and she said, "Handsome?"